Lewis Hamilton proudly flies the Union Jack after clinching the Formula 1 world title in Mexico City on Sunday. Picture: Getty. Lewis Hamilton secured a fifth world title only days after the death of his grandfather, but the Briton believes Michael Schumacher is Formula 1’s greatest driver of all time. Hamilton stood with his arms outstretched and draped in a Union Flag in Mexico City on Sunday evening after becoming just the third driver to have won five titles. 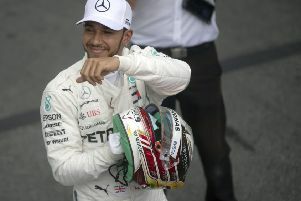 His success this season saw him equal Juan Manuel Fangio’s tally and move to within two titles of Schumacher’s record. But the 33-year-old later revealed that his latest title triumph had been played out against the backdrop of a family tragedy, with his paternal grandfather, Davidson, having died three days before his coronation. Davidson emigrated from Grenada to west London in 1955, taking up work on the Underground. Before he left the Caribbean island, he was known as the fastest man on two wheels following his passion for speed and motorbikes. 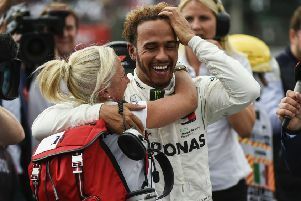 His death provoked Hamilton to pay tribute to his own father, Anthony, who worked four jobs to fund his junior career. Lewis and Anthony, rarely seen in the F1 paddock these days, are slowly rebuilding their relationship after an acrimonious managerial split almost nine years ago. The Mercedes star has more pole positions than anybody else, and is 20 victories shy of Schumacher’s record win tally. At the rate he is going, Hamilton could do the unthinkable and surpass the German by the time his Mercedes deal expires in 2020. “Michael’s quite far ahead in terms of race wins so you have to say he is still the GOAT [greatest of all time],” the Briton added. Hamilton’s post-championship media briefing on Sunday was briefly interrupted by the fashion designer, Tommy Hilfiger. In collaboration with the American, Hamilton has launched his new clothing range in all corners of the world, while producing some of the finest drives of his 12-season career. “Naturally people will have opinions for and against the things that I do,” Hamilton continued. “I don’t do everything perfectly, and I don’t always say the right things, but one thing I do do, is I do me. Hamilton, awarded an MBE after his maiden championship in 2008, is not entertaining thoughts about another trip to Buckingham Palace. “A knighthood is really not something that is on my mind,” he said. “I’ve been very fortunate and very grateful to have met the Queen on a couple of occasions.